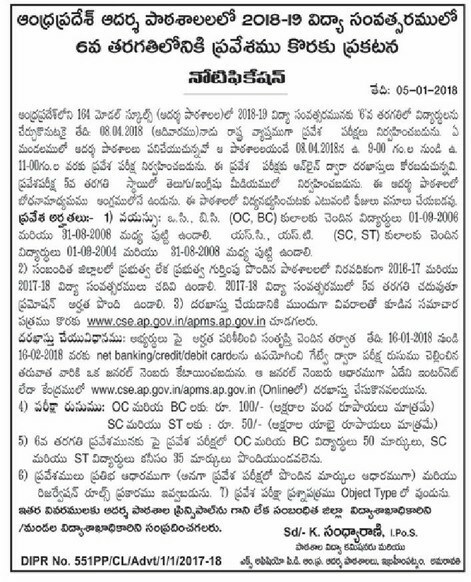 AP Model School E.M Admissions Notification released at apms.cgg.gov.in The Andhra Pradesh Model School (APMS) admission into 6th class English Medium classes. Exam Conducting 6th class entrance exams for admission into 164 model schools across the Andhra Pradesh State. The ap model school sixth class admission test will be held on 8th April 2018. The commissioner of School Education Smt K.Sandhya Rani I.Po.S has released the official notification DIPR No.551PP for AP model school admissions for the academic year 2018-2019. A medium of instructions in model schools totally in English. All the students who domicile from the Mandal or studied in the particular mandal in any recognized institution are excursively eligible for admission into the Model Schools. The entrance exams will be conducted at each Mandal headquarters in all districts of AP. Eligibility: The students should have studied continuously in the respective district for the two academic years (2016-17 and 2018-19) in a Government school or in a school recognized by the Government. The candidates can apply to any AP Model School of the district for which he/she belongs. Parentals Income should not exceed Rupees One Lakh per annum. Age Limit: OC / BC / SC-Converted Christians (BC-C) should have born between 01.09.2006 to 31.08.2008 and students age should have between 10 to 12 years. For SC / ST students should have born between 01.09.2004 to 31.08.2008. Application Fee Structure: The Entrance Test/Registration Fee for SC/ST Students -Rs.50/- and OC/BC: Rs.100/-. Important Dates: The online application begins from 16th January. The last date to submit online application 16th February 2018. Mode of Entrance Test: The Entrance test will be of objective type and multiple choice questions from Class 5th and the Question Paper have Four Parts.